Linden, a new exhibition from Kansas City artist Marcie Miller Gross, debuts as part of Every Street is Charlotte Street, celebrating twenty years of partner organization Charlotte Street Foundation’s Award Fellows. It will open for First Friday on October 6 from 6–8:00 p.m. at Mid-America Arts Alliance, 2018 Baltimore Ave in Kansas City, Missouri. It will be open again for First Friday on November 3, with other public viewings by appointment through November 3. Through an incremental means of building, Miller Gross, a Charlotte Street Fellow in 2004, studies repetition, mass and void, physicality and weight, compression and release. 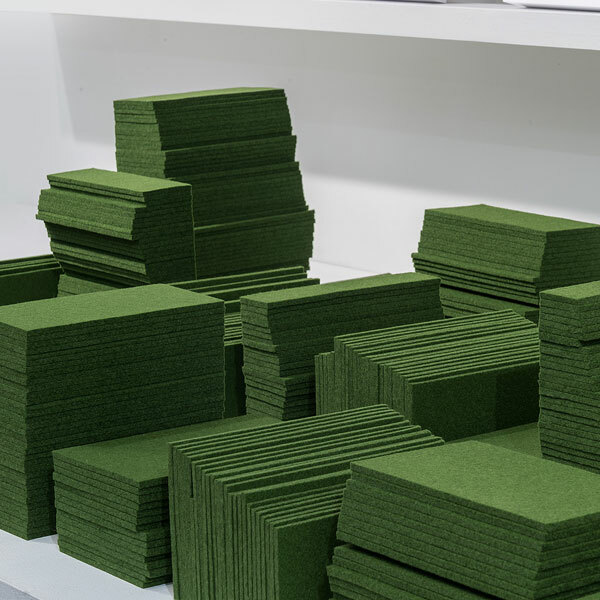 Her work is informed by repetitious activity and simple gestures of the hand, as in folding, stacking, and cutting. Linden is inspired partially by a recent residency to Berlin. Says Miller Gross, “my focus on the city led me to draw connections between the powerful sites of the Berlin Wall Memorial, the Chapel of Reconciliation, and the history and significance of trees and forests in Germany. In this urban context, I found the lushness of the lindens, from darkness to sublime, profound in their sense of hope. The trees buffer, envelop, shelter, offering repose and sanctuary, in their verdant loft. The lindens were a looming protection and a timeless witness to the city’s ghosts.” This residency was supported in part by an Inspiration Grant from ArtsKC. Every Street is Charlotte Street is a cross-platform program featuring twenty years of Charlotte Street Award Fellows. Twenty partners in total across the metro Kansas City area are joining with Charlotte Street to celebrate this unrestricted cash award for artists, and the over 100 artists who have received it.